AND I LIKE TO ROCK!!! 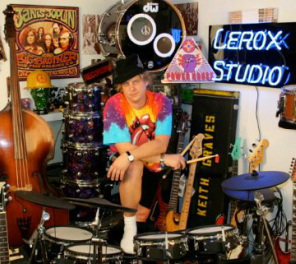 Keith Graves, a long time resident of Santa Cruz, California, is a multi-talented musician, in particular, an accomplished drummer and bass player. As well, Keith is very skilled at rhythm guitar plus, back up vocals, videography and band management. ​Keith has been rockin with a myriad of local and Bay area bands and musicians for over 30 years whose styles range from Electric and Acoustic Rock 'n Blues to Funk, Rap/Hip Hop, Metal, Celtic and Country! As well as being a multi-instrumentalist, Keith is also a skillful and talented photographer and videographer, and has his own LEROX Recording Studio in Santa Cruz, CA. His newest venture is working with Solotech,a local and international provider of advanced technologies for tours, concerts, sporting and corporate events - and more. Currently, he is on tour with Kid Rock on his American Rock and Roll Tour 2018. As well as doing front of stage video at the shows, on some of the off nights Keith will be playing bass with Kid Rock's long time keyboardist, Jimmie Bones in their newly formed band, Jimmie Bones & The Crooks. Keith also plays bass with the Jerry Miller (formerly of Moby Grape) & Terry Haggerty (Sons of Champlin) Band, and is the band and tour manager. The band also includes drummer, FuzzyJohn Oxendine (The Jerry Miller Band, Sons of Champlin, The Rhythm Dukes) and renowned Bay area guitarist, Terry Hiatt, and they have been rockin the California Bay area at venues such as The Ashkenaz in Berkeley, Biscuits & Blues in San Francisco, Rancho Nicasio in Marin, Club Fox in Redwood City and Don Quixote's International Music Hall in Felton. During the 40th Anniversary of the Summer of Love and Woodstock Tours, Keith played bass with Jefferson Starship, Quicksilver Messenger Service, The Jerry Miller Band, and It's A Beautiful Day. Keith then formed and managed a new Quicksilver Messenger Service Band with original founding member, Gary Duncan. Playing bass again, the band also included Prairie Prince (The Tubes, Todd Rundgren, Jefferson Starship) and Donny Baldwin (Jefferson Starship) on drums, plus Dave Medd (The Tubes) and Otis Coen on keyboards. As well, Keith has worked with the Bay area’s Kevin Cadogan, former songwriter/guitarist for Third Eye Blind, playing drums in the studio recording and playing live gigs. Other recording projects include with Prairie Prince and Jim Thomas, writer and guitarist of the Mermen, at Keith's LEROX Studio, as well as at the Mermen Studio. Keith's main local Santa Cruz band venture is managing, recording and playing drums with PIPR - Pure Irish Pirate Rock - born from the damning need of a small crew of talented musicians to continue to play LOUD LIVE ROCK AND ROLL! Debut CD coming soon! Look for upcoming gigs on Keith's CALENDAR!